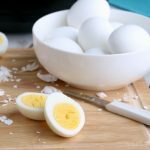 This is literally the EASIEST way to make hard boiled eggs! No boiling, no fuss. Just perfect, easy-to-peel hard boiled eggs! Place eggs gently in air fryer basket. Set temperature to 250º Fahrenheit for 16 minutes. Transfer eggs immediately to an ice bath for 5 minutes. Remove from water to dry.